I don't think that AGFA found some super cool way to manufacture quality CPL's for less than 1/10 of the guys at the top. Fact is, with filters, manufacturer quality does generally go up with price. There are some good ones lower down and some junk ones up above, as with everything, but the general trend is: you get what you pay for. I highly suggest you look for reviews on landscape photography sites. Look for reviews that mention build quality, color cast, ghosting, contrast loss, and other items that additional glass in front of your lens can cause. Also, check out this question: How do I choose a polarizer? And this one: How do you handle the varying sizes of filters in your kit? Your best bet is to spend the money and get quality filters, at the largest size that you need, and use step-up rings for smaller lenses. Now, whether that's a few circular filters or a square kit (Cokin, Lee, Formatt-Hitech, etc)...that's a whole other question. The shots all appear out of focus even though focus was good and depth of field was good, even though the filter was clean. As a guess, I removed the filter and the problem went away. That probably indicates that you were using a linear polarizer like we used back before the invention of autofocus. AF doesn't work with linear polarizers. When AF came out, polarizer filters were modified with a quarter-wave plate placed behind the actual polarizing material to reorient the polarized light waves in a non-intuitive circular pattern. Thus, we started calling them circular polarizers. This allows AF to continue functioning when using a CPL. Even though the very cheap AGFA filter you were using is supposed to be a CPL, it appears to have either a defective quarter wave plate placed behind the actual polarizing material or the quarter-wave plate is not oriented as required at an exact 45° angle to the orientation of the main polarizing material. Or maybe it is an out-and-out counterfeit that does not even have a quarter wave plate behind the polarizing material. He compared six different CPLs in 77mm diameter ranging in price from $102 to $200 purchased from a reputable major online seller (listed in alphabetical order). He found that all of them were at least 99.9% efficient at polarizing light. He couldn't say any were more efficient than that because 99.9% was the limit of his measuring setup. He found that all of them were flat enough to not affect IQ more than any of the others. In his words, "They all passed with flying colors." Roger did point out that some shooters might actually want the ND effect of less transmission when using a polarizer, which is often used in bright sunlight. So it is not always necessarily true that more transmissive translates to better in terms of CPLs. In terms of spectral response, the two high transmission CPLs (B&W and Marumi) had near identical graphs between 430-700nm, with a flat line from around 500-700nm and a drop off on the blue end of things with significant limiting of UV wavelengths. The rest had curves similar to each other but different from the two high transmission filters. There was no UV cut or drop off in the blue sections, there was a slight rise through the green wavelengths, then a very modest dip from green to red before a slight rise to infrared. Neither type had individual differences between color when oriented to block the most light and when turned to block the least. 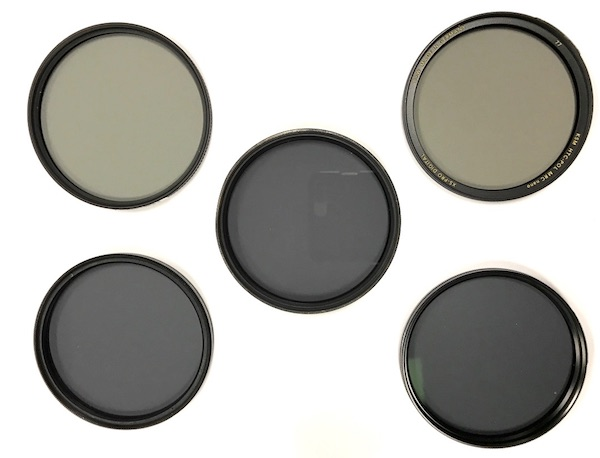 If you are buying a circular polarizing filter because you want some circular polarizing, it doesn’t seem to matter much which one you choose; they all polarize like gangbusters. So I saved you some money today. The second point, one which I’ve been told before I did all this testing, is set the white balance after you put the CP filter on, not before. Because CP filters will have a color cast. Or just shoot in raw and fix it later, which is what we mostly do anyway. I didn’t want to test filters; I really didn’t. But people wanted me to. So I chewed up my testing equipment budget to buy laser transmission stuff and an optical spectrometer, spent a few weeks getting everything calibrated and establishing norms, and then a couple of days testing these CP filters. I did this in clear violation of Roger’s Third Law: No Good Deed Goes Unpunished. After I was done, I told Aaron I had just documented that CP filters had different light transmission percentages and different color casts. And that high transmission filters had one look, and it was different than regular CP filters, which all were really similar. Because I was proud that my investment in time and money had paid off. 38% - Tiffen CP with a spectra very similar to the four non-HT filters above. 53% - Hoya HRT with a spectra very similar to the two HT filters above. He observed that the lower transmision seemed to be related to the lack of anti-reflective coatings on the cheaper filters. They were also as flat as his test could measure, just like the first six filters. ... There’s not much question that as far as polarizing light, cheap CP filters do it very well. They also, as you would expect from uncoated or partially coated filters, reflect a LOT more light. This is a significant issue on a clear or UV protection filter. I’m honestly not confident if it’s as big of a deal for a polarizing filter. Not the answer you're looking for? Browse other questions tagged lens filters zoom or ask your own question. How do I choose a polarizer? Polarizers: Linear vs Circular. How does it affect a photo? What is a source for small pieces of thin, high-quality, polarizing film for use with rear-filter lenses? Why does a linear polarizer work as well as a circular one on a P&S camera? Screw-in or square filters in the field? Polarizing filter causing soft, hazy shots? 95mm circular polarizer: B+W, Sigma, or other? Is the Cokin 173 filter just a backwards CPL?